Home / Movie Database / Shazam! Download Shazam! in Digital HD from the iTunes store. Shazam! images are © Warner Bros.. All Rights Reserved. What if one day you were a fourteen-year-old kid and the next you were a male superhero in his thirties? How would you handle it? Would you be freaking out? What if you obtained those powers from an ancient wizard? Imagine you could switch back and forth between adult and teenager by just uttering one simple word – Shazam! 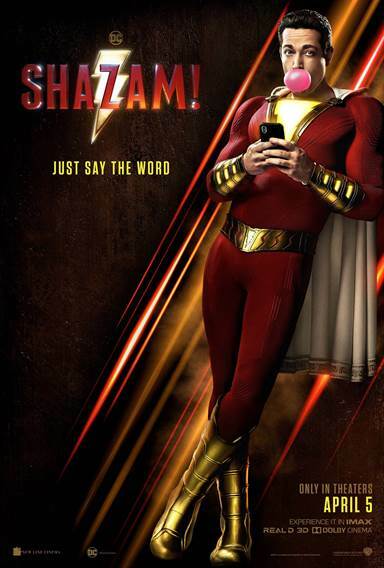 In the ever-growing genre of superhero films, DC Comics brings us their latest entry…that one little word – Shazam! Coming to theaters this month, this is one unconventional and, at times, a somewhat reluctant superhero. Billy Batson (Asher Angel; Andi Mack) is an orphan who has run away from countless foster care homes. He only has one dream…finding his mom. After his latest attempt, he is sent to live with a very nice foster couple who run a group home of sorts. There he meets Freddy Freeman (Jack Dylan Grazer; It), who walks with a crutch and is a superhero fanatic. When some older boys pick on Freddy at school, Billy defends him and suddenly finds himself on the run. A few days later he ends up in a cave where he meets the magical Wizard. The wizard explained that Thaddeus Sivana (Mark Strong; Kingsman: Secret Service) has unleashed the seven deadly sins and that he needs Billy to take his powers to stop them. 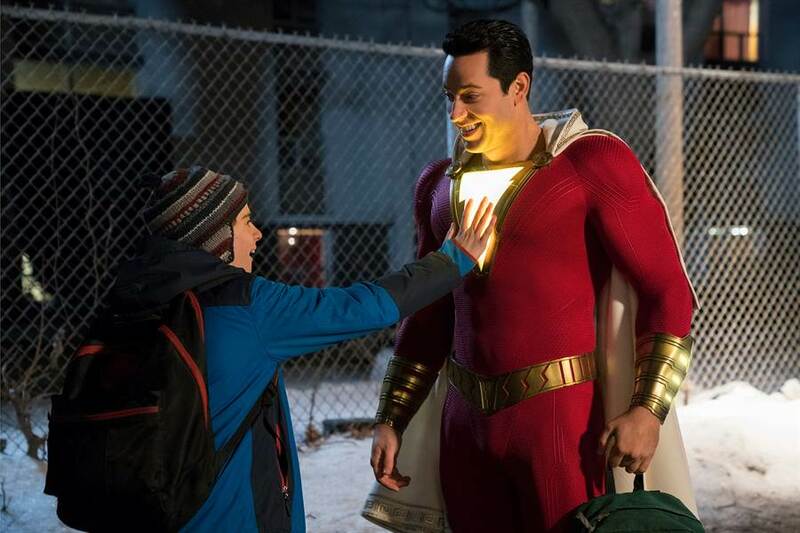 With one little word, Billy suddenly is transformed into Shazam (Zachary Levi; Chuck). Not knowing what to do he enlists the help of Freddy as the two test Shazam's powers. Shazam then spends the next few days being a "do-gooder". Things suddenly change when Sivana shows up with the sins and starts wreaking havoc on the town. Billy once again wants to run away but steps up to the plate so to speak when Sivana threatens Billy's "family" – the other foster kids. With their help, he defeats the sins and restores order. Even though he is young, Grazer is already a fairly accomplished actor and this role is no exception. He is great as Billy's geeky friend, having the appropriate reaction to finding out Billy is suddenly a superhero. Asher is also well cast and the two young actors have good chemistry. Levi is obviously the star of the film and was a great choice to play the man/child. His portrayal of a boy trapped in a man's body is spot on and believable. Strong is such a versatile actor and he masterfully plays the bad guy. The rest of the supporting cast is great as well adding some of the most humorous moments in the film. Director David F. Sandberg (Annabelle: Creation) does a wonderful job with this story. The film flows well and doesn't drag at any point. He nicely highlights the life of a foster kid without being preachy. The effects in the film don't look especially fake or cheesy. The seven sins are distinct and detailed and Shazam's suit looks authentic even though it probably was supposed to be a little tongue in cheek considering the nature of the film. Shazam! Is humorous, heartwarming, and lighthearted with a very good cast and a fairly decent script. It also shows a more positive light on the foster system and celebrates these young people dealing with a situation that was not of their own making. It is family friendly fare and is a good choice to take the kids to during spring break this year. Unless you are coldhearted, you will most likely walk out of the theater with a smile on your face after enjoying a few laughs. Shazam! images © Warner Bros.. All Rights Reserved.